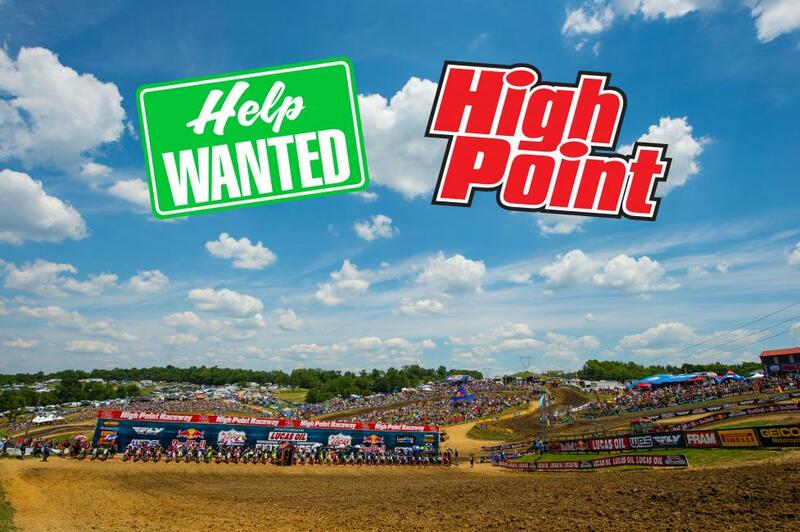 The 2018 Red Bull High Point National is Saturday, June 16th and Racer Productions is looking for flaggers and other event staff opportunities. This is the 42nd Annual year hosting an AMA National at High Point and we’re back on Father’s Day Weekend, so expecting an extra special weekend! This is your opportunity to be a part of the working staff at High Point Raceway on June 16th. This is your chance to get up close to the fastest motocross racers in the world and get some great perks for your time and effort. We are looking for capable and hardworking racers that understand the importance of flagging and on-track safety. Must be 18 or older and experience is preferred. $10 per hour. Multiple shifts available throughout the weekend. Contact Jessica Coombs at [email protected] or 304.284.0084 for the Flagger, Gate Guard, Ticket Takers and Trash Picker positions detailed above. MotoTees is looking for reliable staff to work Saturday. Please see below for more information. Report to Rider Services/Will Call for ticket and then report to MotoTees trailer in Sponsor Village. Bring ID and a lunch. Contact MotoTees at [email protected] to make arrangements.